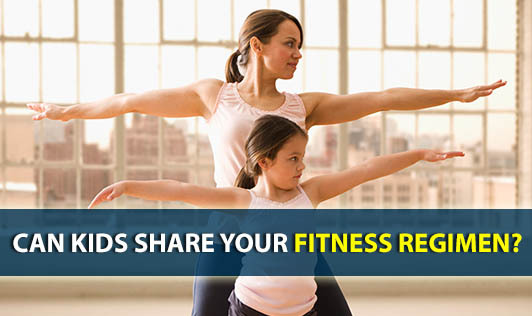 Can Kids Share Your Fitness Regimen? For many of us, working out everyday can be boring! Working out doesn't always mean that you need to go to a gym. Creating opportunities in your daily life is also a way to explore a lot that can help keep you fit and healthy. You will be surprised to know that taking a walk with your kids not only burns calories but also helps improve your metabolic rate and gives you positive energy. We get so caught up in the daily work that we forget to take time out for ourselves. Playing with your kid can be relaxing and can also be more fun. Most of all, it will help you stay consistent and motivated. Plan your trip to a place where you can find some adventurous activities like water sports, trekking, skiing etc. This can be an absolute stress buster. It will develop a sense of bonding with kids. Put on your favorite tunes and dance with your kids. Make funny walks and be innovative. If it’s fun for your kids, you will have to repeat it. Thereby you can sweat out and burn more calories. Yoga is considered "kid friendly". Like any other activity yoga is known for its several health benefits and has aided to prevent various ailments. Practicing yoga is challenging and creates excellent opportunities for you and your kids to keep the body and mind healthy.